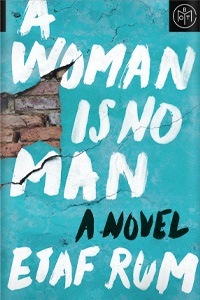 I need new features for this little blog! I was thinking of some way to incorporate my newest subscription fav, Hungry Harvest, into a post. Just posting a list and picture of what I got is kind of boring, so I thought maybe I’ll list some new recipes I’ve tried that incorporate what I received and do some mini reviews on those. 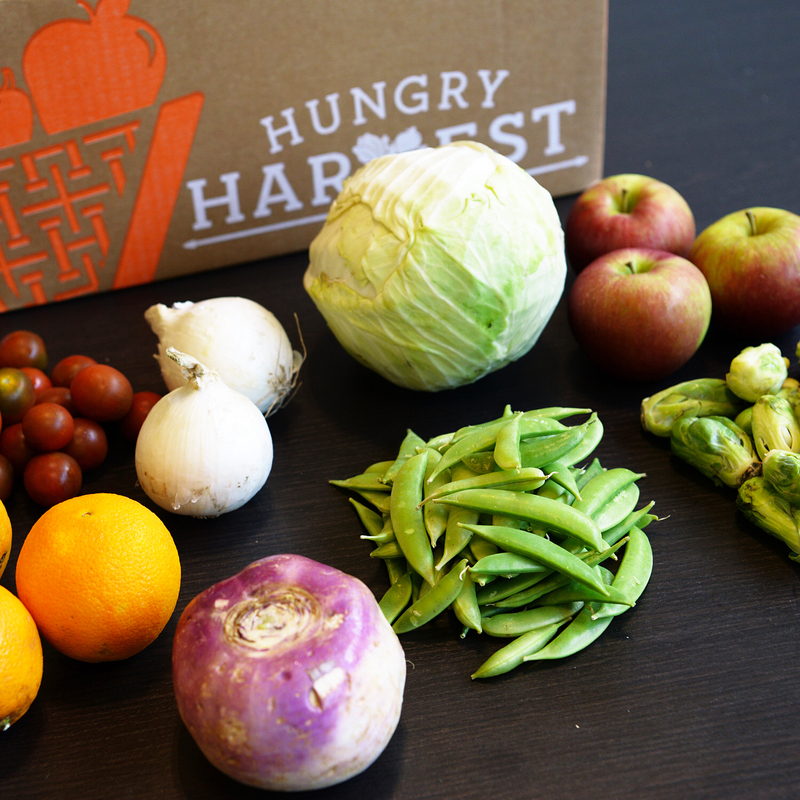 For those that haven’t heard of it, Hungry Harvest is a weekly or biweekly subscription box for fruits and vegetables. They send produce that would normally go to waste for silly reasons (being too small or having a slight dent, etc) so you can use them up! There’s different sized plans, from the Mini one good for 1-2 people to one that would feed a large family. You can also choose between fruit + veggie, fruit only, or veggie only. The one I have is the mini one with fruit + veggie which is $15. There are options to customize your box for a small fee of $1.25, but I never do…I just work with what they give me. You can also make a “never” list of things you never want to receive. I’m not super picky, but the one thing I did put on it is grapefruit because I haaate grapefruit. I get one box every 2 weeks which works out pretty well for me. The delivery day is always the same for whatever area you’re in. NJ is Friday, and an uber driver actually delivers it which is kind of funny. Anyway…I’ve received 2 boxes so far, so this will be a longer post than it would normally be. For my first box from 8/3, here’s what I got and what I made! I’ll normally try to post photos of all of these if I can remember, but I don’t have photos for most of these right now. Unfortunately, these ended up being kind of a disaster, but I attribute that to user error rather than the recipe. I’ve made sweet potato fries in the past and they were good, but I think what happened with these is a put a bit too much oil and they ended up not crisping up enough and being too soft. The flavor was good though! Will definitely take another crack at these if I receive sweet potatoes again. Watermelon is one of those things that I would have never purchased myself, but I don’t know why because its so good! 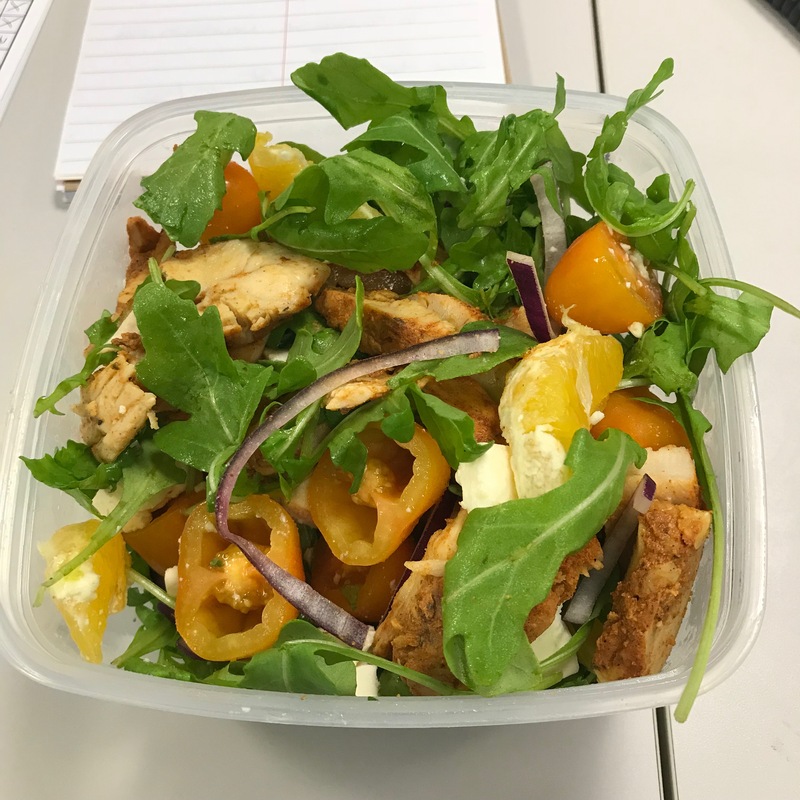 I used chunks of watermelon, the basil, the grape tomatoes, and the greens for this salad. I also added in feta cheese. Very delicious and summery! I had a lot of watermelon left over, so I just snacked on the remainder and also gave some to Steve’s mom. I didn’t follow a recipe for this one…completely made it up, and it turned out delicious! For this, I used the bell peppers (2 of them), the mushrooms, onion, and garlic. 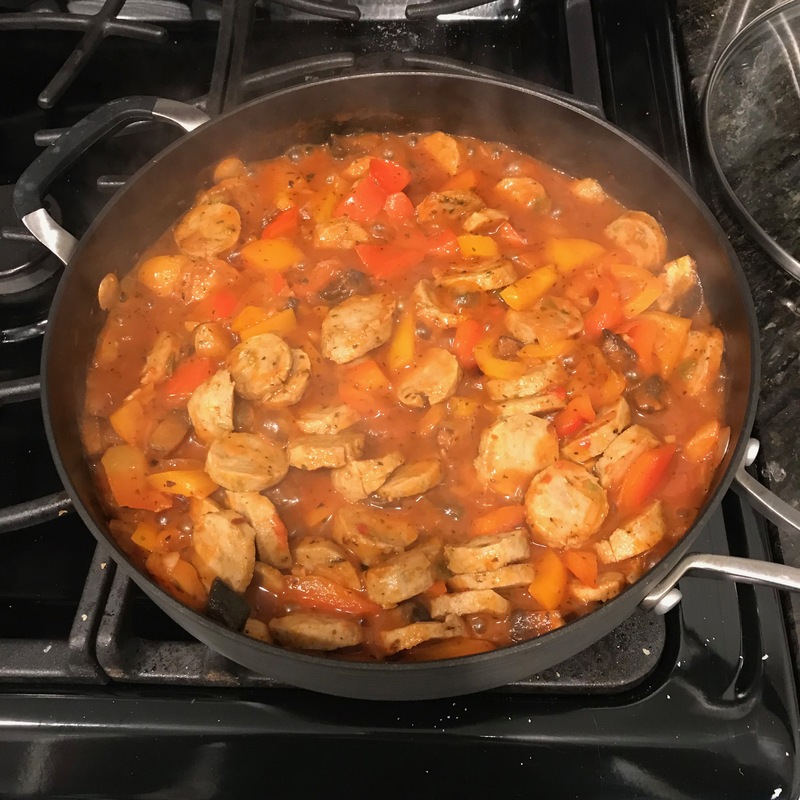 I basically sauteed the veggies with some seasonings (oregano, basil, thyme) and then added some sweet chicken sausage and a can of tomato sauce. Served over pasta…so yummy! I used up the remainder of the mushrooms on a side dish later in the week and the remaining pepper on a beans dish. As for the remainder of the produce, the apples Steve took care of (he brings them to work as a snack). I think they always send apples so luckily they’ll always have a place to go as I don’t really eat them. The lemons that I get as extras I always have with water. 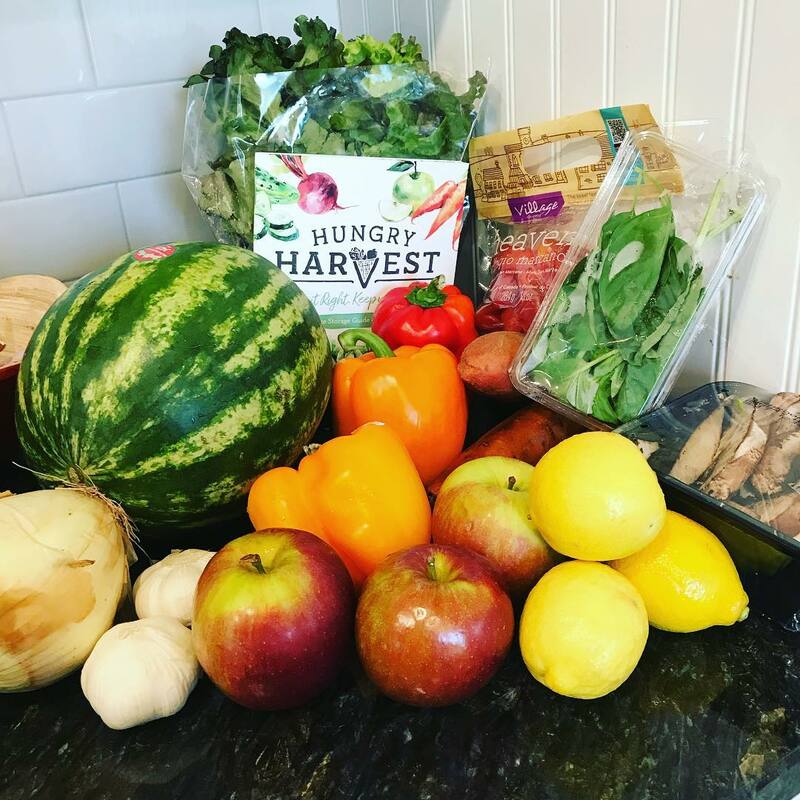 Photo from the Hungry Harvest instagram. I forgot to take one! This was the most common recipe involving cabbage (which I had no idea what to do with) so I thought I’d give it a go. For this I used the head of cabbage and one of the onions. It was a very time intensive process and takes like an hour to cook. You basically wrap ground beef in cabbage leaves (which you carefully take off and heat up a bit so they’re softer), secure with a toothpick, pour over tomato soup or a tomato sauce of your choice and bake (the recipe says to pan fry, but I chose to bake). They turned out…eh. The filling was pretty good, but the texture of the cabbage was very hard to work with and cut. I’m not sure if I did something wrong with it or not. Maybe I needed more liquid around the cabbage while baking to soften it more…I’m not sure. Maybe I just don’t like cabbage? This was a winner! I used the turnip, obviously. This is more of a mashed potato + turnip recipe rather than just mashed turnip. I did have about an even amount of both though! I added an extra tbsp of butter (because…butter!) and a little garlic powder, but otherwise followed the recipe exactly. Was a very delicious side dish to our salmon! For this I used 1 of the oranges and the grape tomatoes. I made a couple substitutions (used feta cheese in place of the gorgonzola cause its what I had) and obviously added the tomatoes. I also added some grilled chicken to make it more filling. Not super exciting but definitely not bad! I loved the dressing in this the most, which incorporated honey. I love a good stir fry! I used the sugar snap peas, 1 of the onions, and garlic. 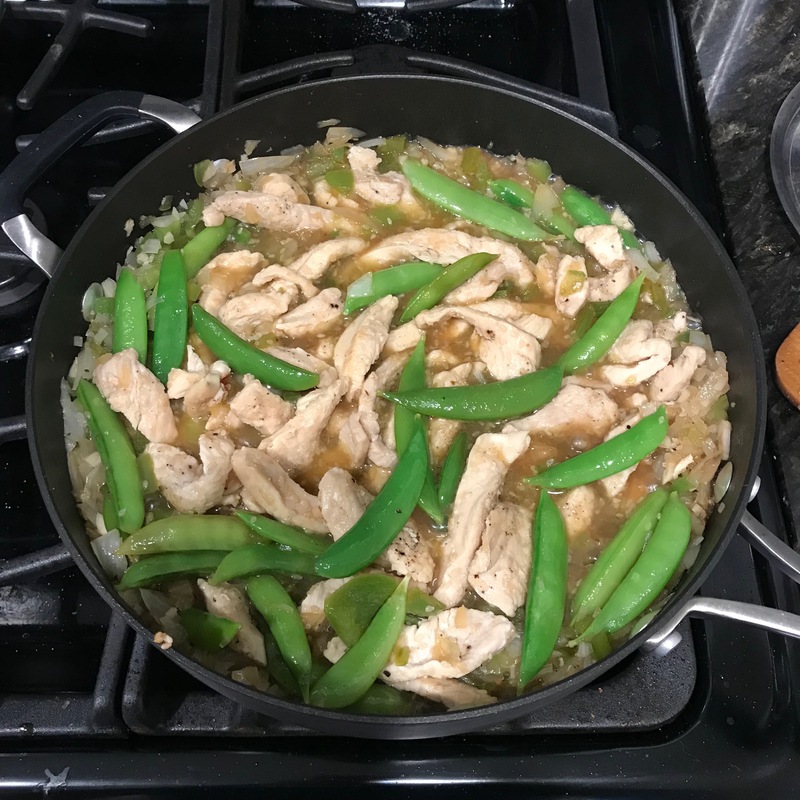 I had never used or cooked with sugar snap peas before so this was a new adventure for me…one of the reasons I love the surprises I get in these boxes. It turned out okay. Sometimes the texture of the sugar snap peas was a bit stringy (like celery can be), but overall not bad. This was also very simple to make which is what I was going for since the cabbage rolls and turnip mashed potatoes were a bit involved! 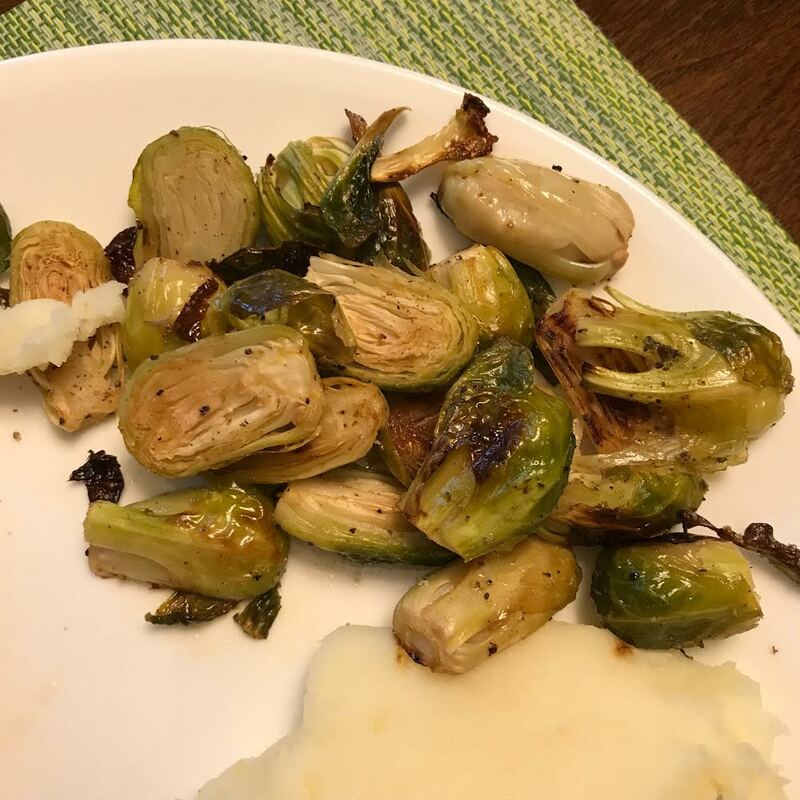 I was super excited to see that I was getting Brussels sprouts because Roasted Brussels Sprouts is a favorite of mine! This is a very simple way to prepare them…just some oil, salt, pepper (I also added some garlic powder), pop it in the oven and thats it! Delicious! I will say 30 minutes is probably a bit too much…I would say about 20-25 should do it (or even less on a higher temp). I love throwing in the leaves that fall off from the brussels too because they end up super crispy and yummy. 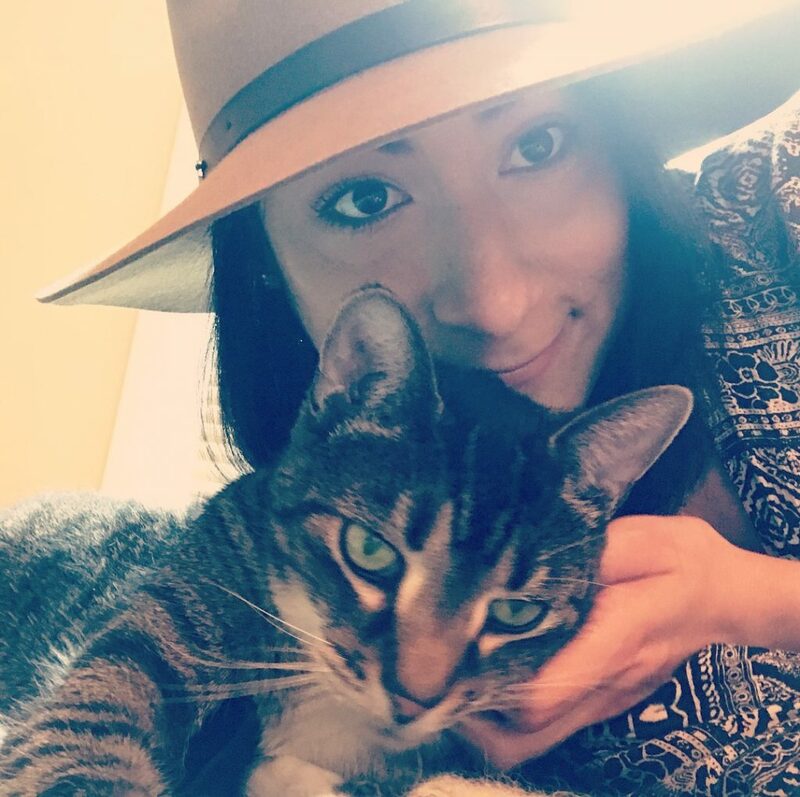 Previous Post: « Updates + Kittydelphia!